EA highlights the very best footballers each week with FUT TOTW 31. 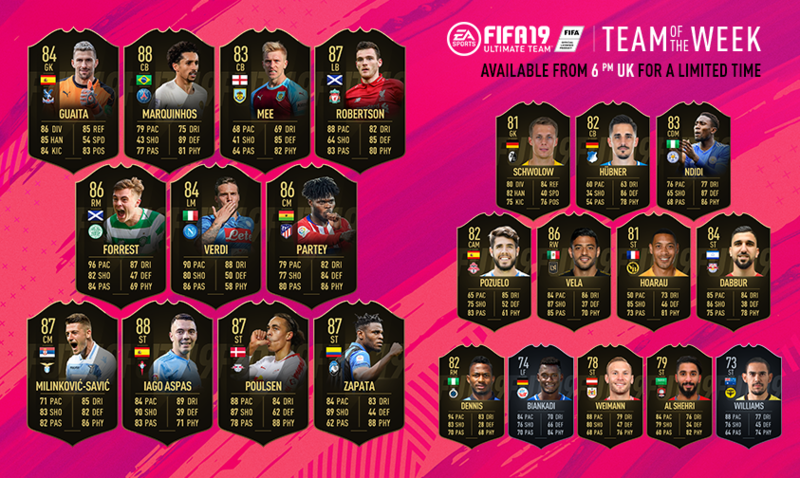 FIFA 19 Team of the Week is currently in week 31 shining a spotlight on players like deBruyne and Coman, but what does this mean exactly? Well, every player selected for the FUT TOTW 31 has received a significant stat boost, making the cards featured extremely valuable. In this FIFA 19 TOTW 31 Guide, we've listed all of the FUT TOTW players for week 31, April 17. We'll also give you some background as to what TOTW is, and when you'll see the cards refresh each week. For more on FIFA 19, be sure to check out our FIFA 19 Guides Hub. 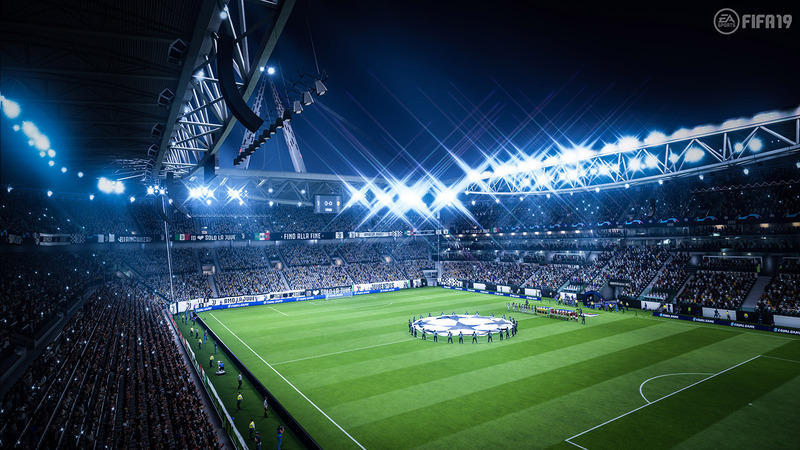 It’s got links to a ton of useful guides on FIFA 19, including details on FUT 19, tips on how to score more goals, and more. FIFA Ultimate Team Team of the Week Explained - What is FUT TOTW? 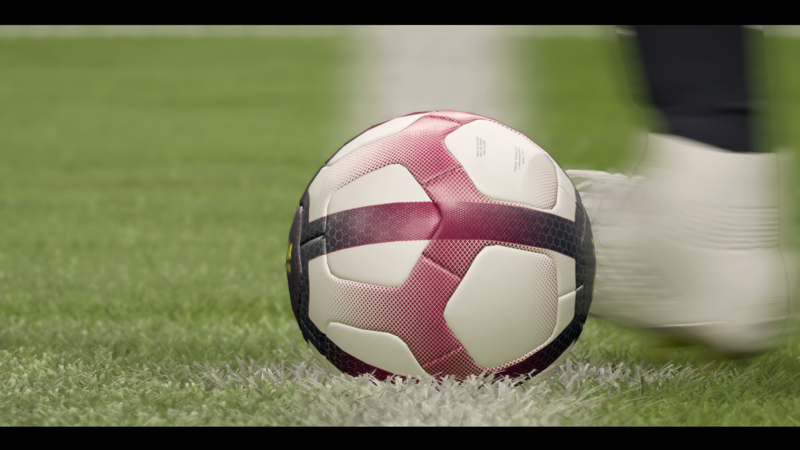 EA Sports regularly updates FIFA Ultimate Team, adding in new ratings, special items and events. Every week, a Team of the Week, or TOTW is highlighted, listing 23 players that are in great form in the real footballing world. There are 11 starters, 7 Subs, and 5 reserves, with each player receiving a stat boost over their standard card form. The reason you want to keep an eye on these TOTW releases, is that the players receive stat boosts. These stat boosted versions are introduced into packs and then onto the transfer market. 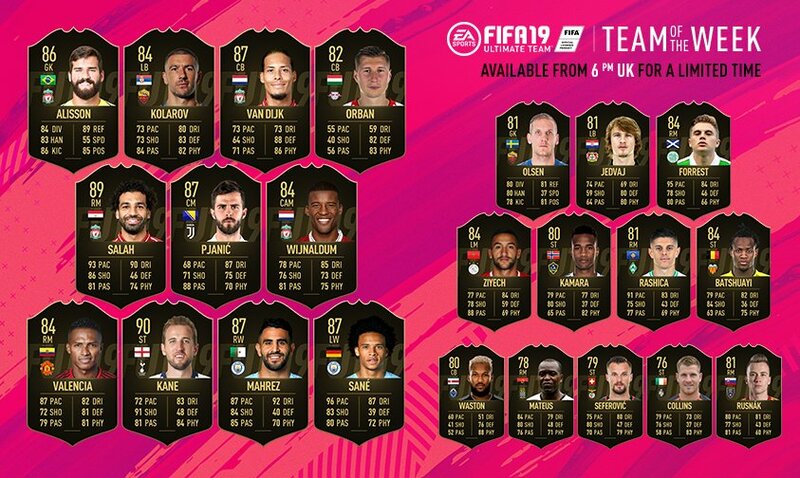 Standard cards do not receive a boost, so picking up these TOTW cards can be a really great perk to have in your squad. This week's players come via the FUT TOTW 30 Picks. The best thing about FUT TOTW is that if you miss out on any cards, there's always a new set to work towards each week. 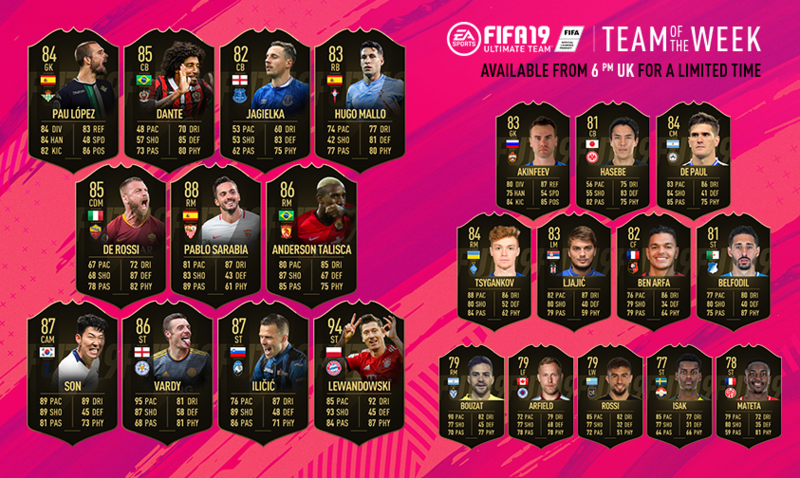 The FIFA 19 Team of the Week lineup refreshes at 5PM GMT/ 10AM PDT every wednesday, so be sure to prepare for each drop by saving your FIFA Coins. Each week, usually on the Tuesday, we'll be putting up some predictions as to who will get picked for the TOTW that week, so stay tuned for updates to this page. FUT TOTW 30 gives players the opportunity to collect stat boosted versions of the best players in the world of football. It also serves up a unique Squad Battle in the form of the TOTW Challenge. It's pretty straightforward, tasking players with taking on the active Team of the Week, but there are some pretty great rewards to be had. 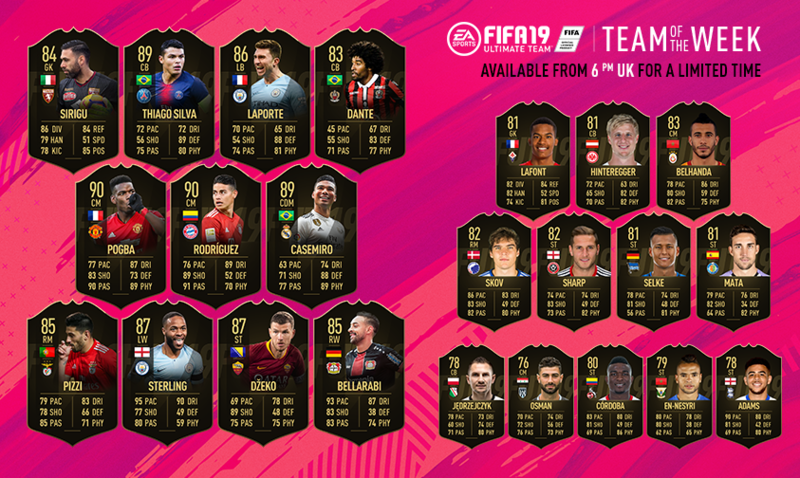 Now that you know which players will be available as part of FUT 19 TOTW 30, you’ll need to know how to get them. The TOTW player cards are distributed into card packs, so you’ll need to buy packs and hope that you’ll get one. For the week that a player is featured in TOTW, their standard form will not be available to pick up from packs. You can also head to the transfer market to purchase TOTW player cards. They tend to be pretty expensive, but are sometimes worth it for the associated stat bonuses. We'll be listing the previous FIFA 19 TOTW releases below. You can use this to check which players might still be in circulation, and to inform your transfer market trading decisions. 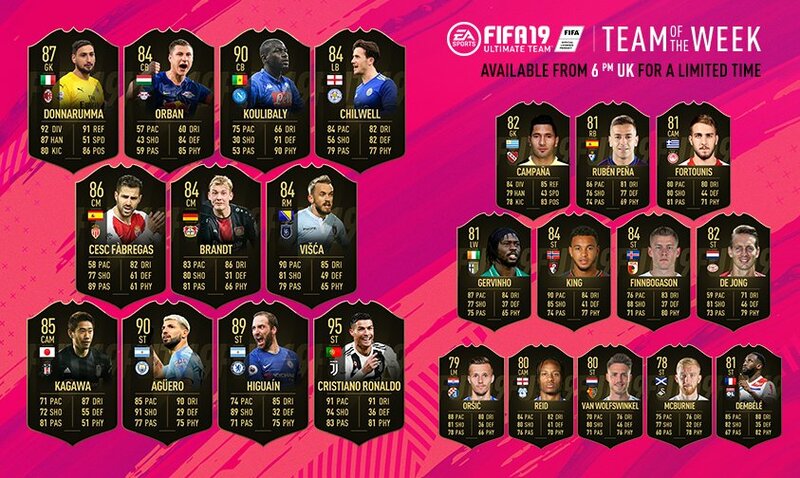 EA has now revealed the full lineup for FUT TOTW 30. It includes a great selection of players which have received in-form cards. Let's take a look at the full lineup. EA has just released the details for FUT TOTW 29. It features a great selection of world-class players such as Verdi and Zapata. Let's take a look at the full roster. EA has just pulled back the curtain on FUT TOTW 28. 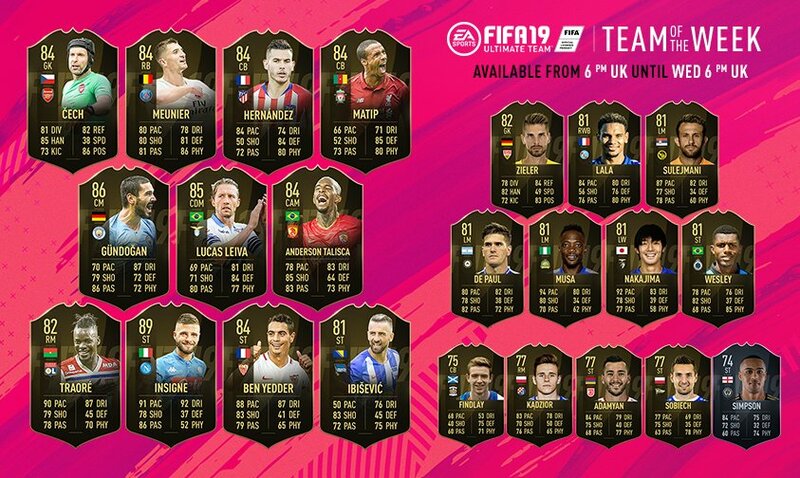 It's an impressive roster, featuring a bunch of world-class players who will receive in-form Ultimate Team cards for the next 7 days. 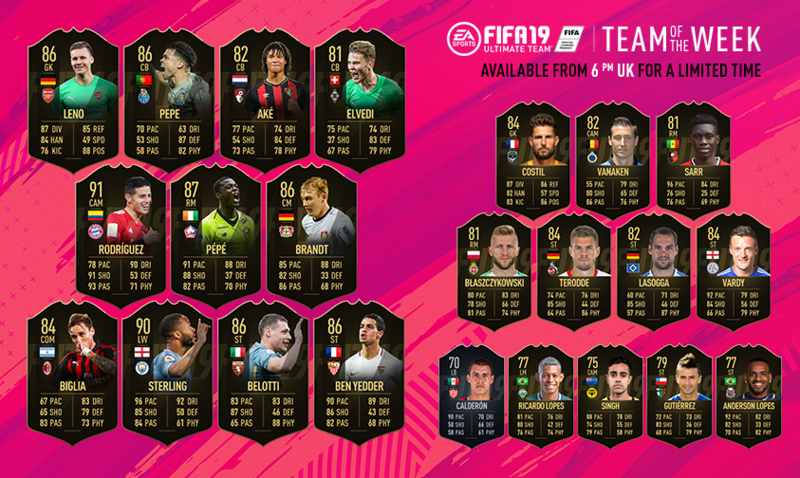 Let's take a look at the full FUT TOTW 28 lineup. 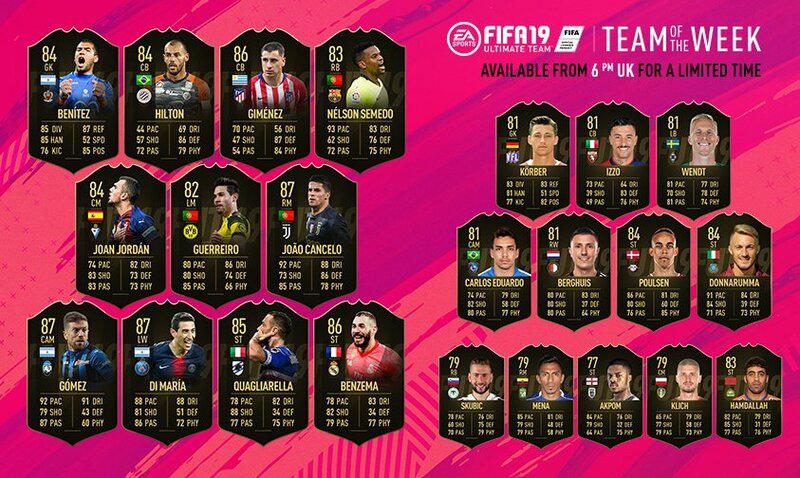 EA has revealed he lineup for FUT TOTW 26. It includes a bunch of world class players, from lightning fast wingers like Sterlling, to unstoppable keepers like Leno. Let's take a look at the full FUT TOTW 26 roster. 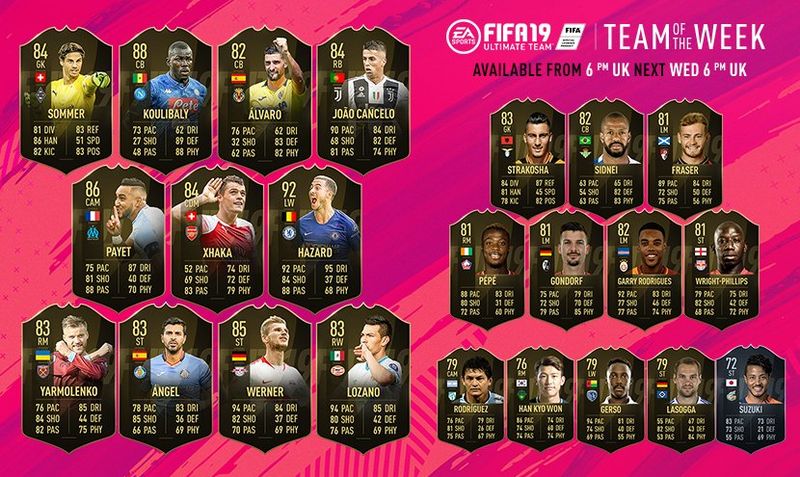 EA has revealed the full lineup for FUT TOTW 25, and it's a great roster all round. There's the world class keeper Donnarumma, an updated Lukaku card, and more. Let's take a look at FUT TOTW 25. 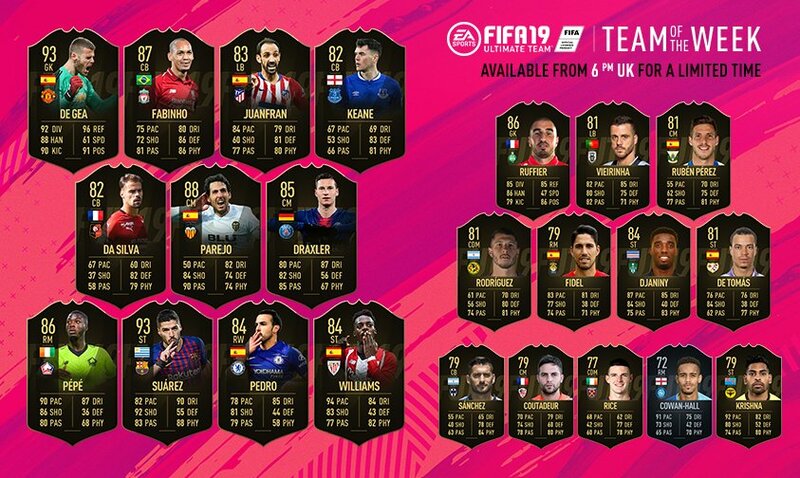 EA has just revealed the lineup for FUT TOTW 22. It highlights world class players like Sterling and Dzeko. Let's take a look at the full roster. EA has picked some absolute stunners for FUT TOTW 21. The likes of Ronaldo and Donnarumma feature, alongside some other truly fantastic players. Here's the full lineup for FUT TOTW 21. EA has pulled back the curtain on FUT TOTW 20, highlighting world class players like . 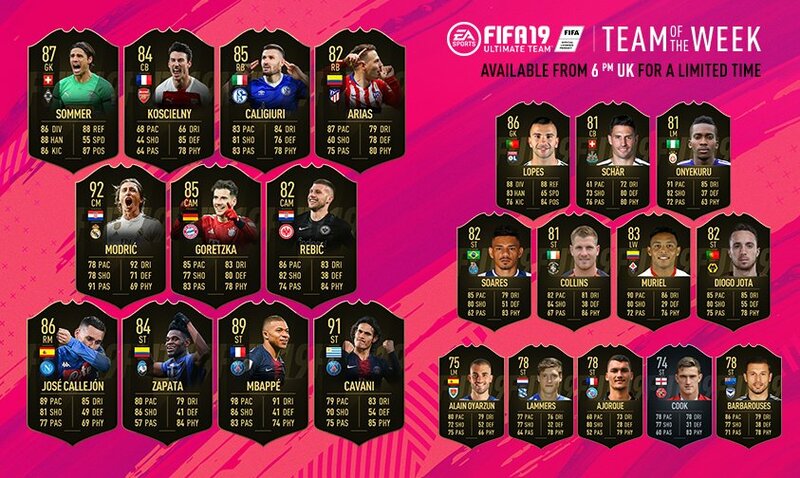 Let's take a look at the full FUT TOTW 20 lineup. 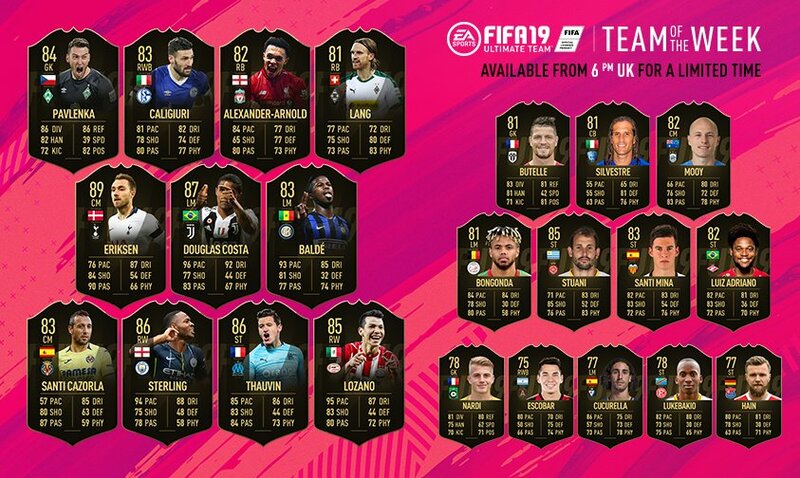 Ea has just reveled the TOTW 17 for FIFA 19. There are bunch of awesome world-class players to pick up this week, including Fernandinho and Santi Cazorla. Let's take a look at the full lineup. The FIFA 19 TOTW 17 lineup has been released and it's a pretty impressive week. Headlining is Chelsea's (but for how much longer?) Hazard, who hits a huge 93 rating. Other top players this week include the young goalkeeper, Donnarumma, and Firmino. The subs bench is also pretty hot this week, with Manchester United's Rashford reaching a rating of 84. FUT TOTW 13 is here, shining a spotlight on such world-class players as Chiellini and Pierre-Emerick Aubameyang. Let's take a look at the full lineup. FUT TOTW 11 is here, shining a spotlight on world class players like Raheem Sterling and Douglas Costa. Let's take a look at the full lineup. 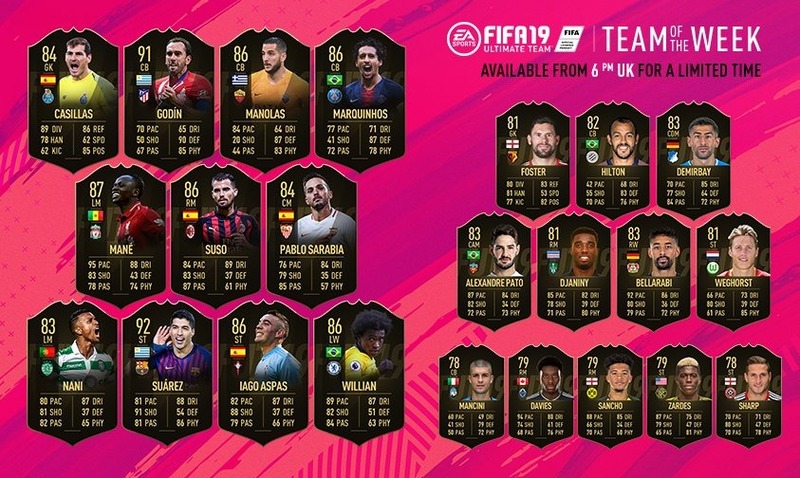 FUT TOTW 10, featuring awesome players like Salah, Kane and Valencia. Let's take a look at the full FUT TOTW 10 roster. 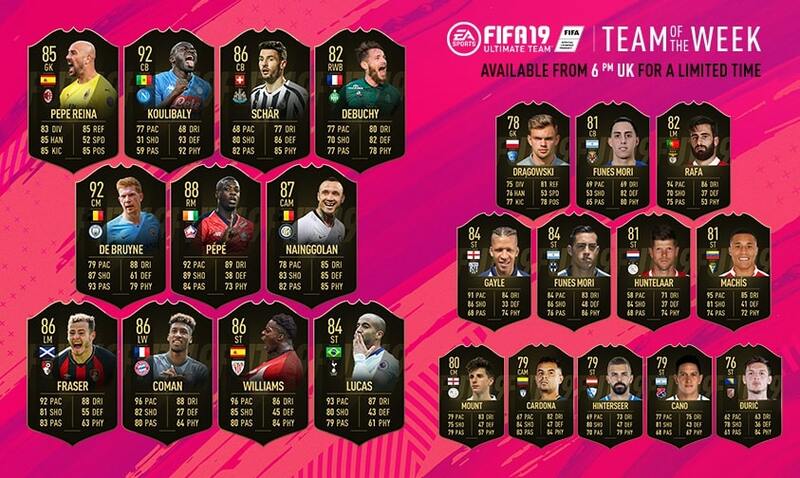 EA revealed the lineup for FUT TOTW 9. It put a spotlight on some of the world's best players, with the roster including superstars like Hector and Rami. 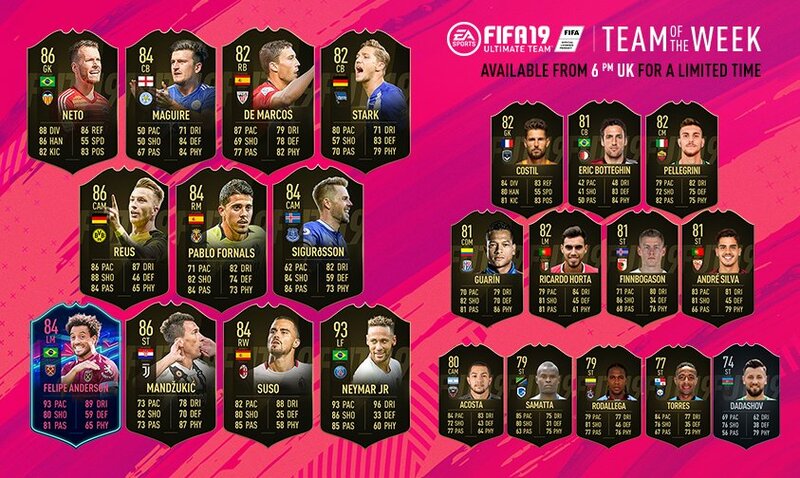 Let's take a look at the full squad for FIFA 19 TOTW 9. 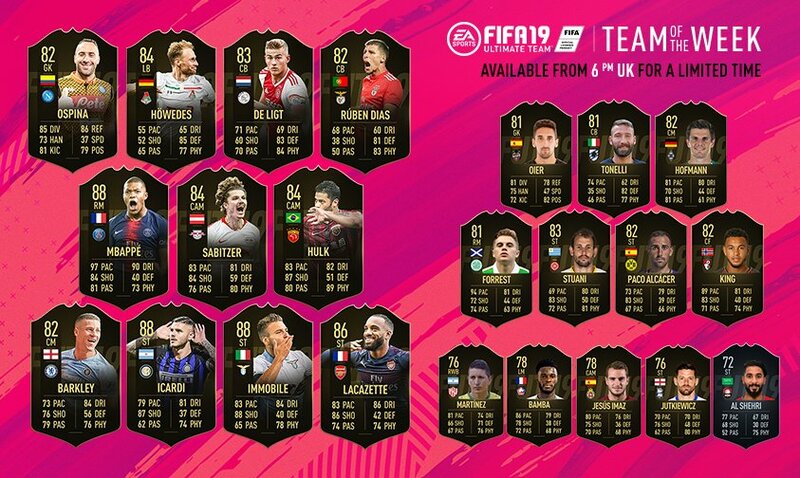 Great news FIFA 19 fans, TOTW 8 is finally here. It offers stat boosts for the world's best players, including Banou, Blind, Valeri. We've listed them all below, and broken them up into main squad, subs and reserves. 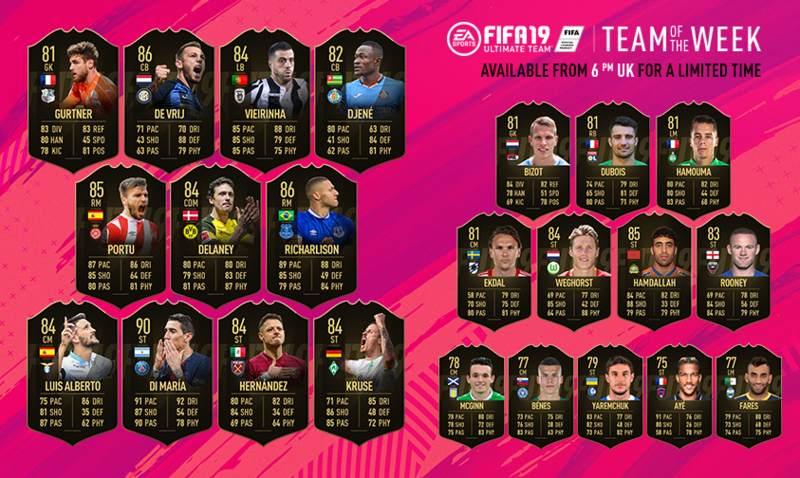 Be sure to check out the FUT TOTW 8 lineup for November 7 2018. 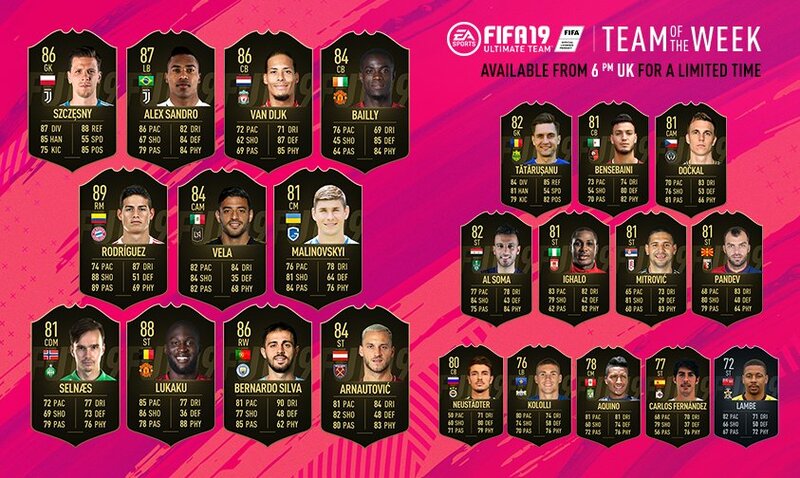 FIFA 19 TOTW 7. The headliner this week was Barcelona's Surazez, who comes in with a rating of 92 after a great game agaist Real Madrid. Also highly rated is CB Godin, on 91. Chelsea's Willian is on 86, and Liverpool's Mane gets an 87 rated card. 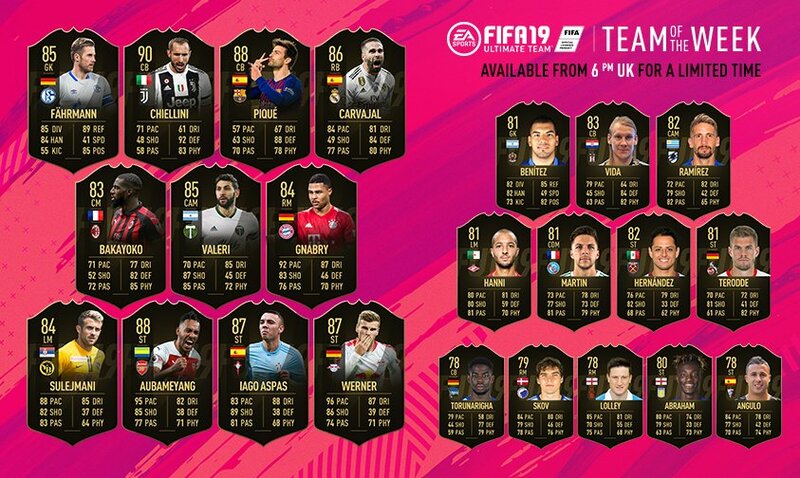 FUT TOTW 6 is finally here. It takes a look at the very best players from matches over the last week or so, offering in-form cards and bonuses. Week 6 shines a light on world-class players like Di Maria, Lewandowski, and Pickford. Let's take a look at the FUT TOTW 6 players. 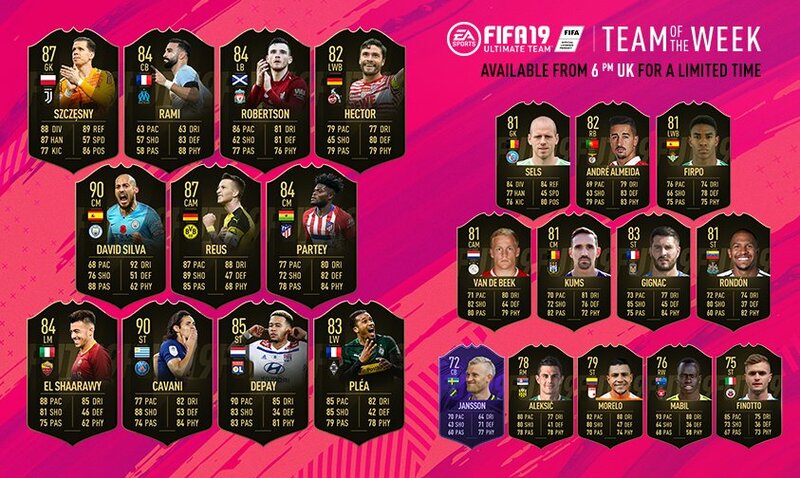 FIFA 19 TOTW 5 has been released. It was made up of the best players in football, based on performances in marquee match ups. You'll find awesome players like Lukaku, Van Dijt and Bernardo Silva, let's take a look at the full lineup. FUT TOTW 4 went live in FIFA 19 at 5 p.m. GMT/10 a.m. PDT on October 10, and ran until October 17. It put a spotlight on the very best players from matches over the last week. It features such greats as Mbappe, Ospina, and Hulk. We've listed all of the FUT TOTW 4 players below, alongside their respective stats. The FIFA 19 TOTW 3 is went live on October 3, 2018, and ran for one week. The lineup of players for TOTW included such superstars like Neymar Jr and Sigurdsson. 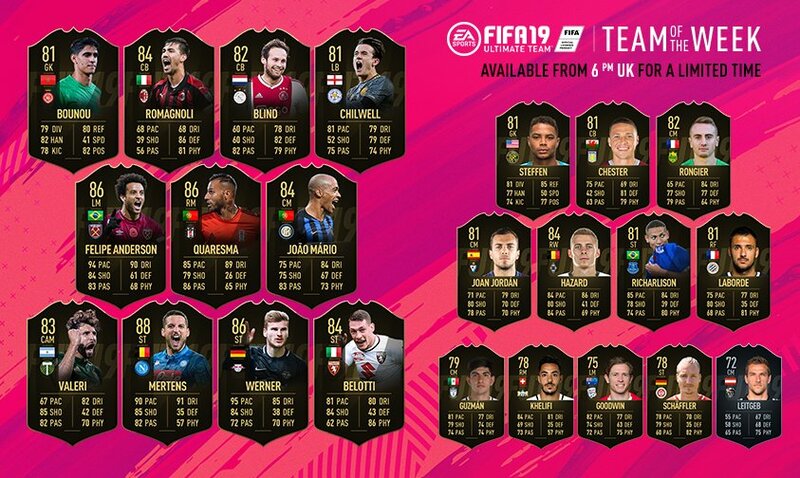 FIFA TOTW 3 listings below. 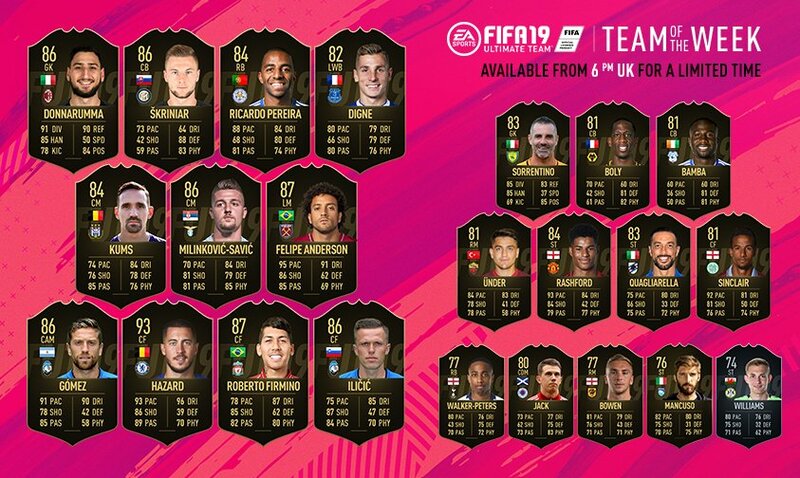 FIFA Ultimate Team 19 TOTW 2 was available from September 26 at 5PM GMT/ 10 AM PDT right up until October 3 at the same time. It shined a light on some excellent players, like Cech, Yedder, and Insigne. 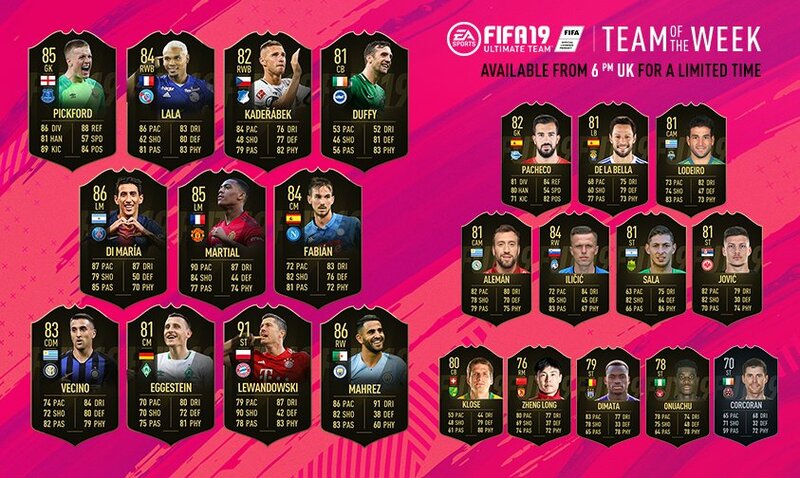 FIFA Ultimate Team 19 TOTW 1 was available from September 26 at 5PM GMT/ 10AM PDT right up until October 3 at the same time. Tagged with FIFA Ultimate Team,	Guides,	PC,	PlayStation 4,	Sports,	Xbox One.